A project by Giori Politi, Sharon Duek, Jonathan Abramson and myself which developed / composed especially for the Brain Tech Israel 2013 conference this week. In this project we created a musical soundtrack based on mind waves transmitted from an EEG headset. The generated musical line is parameterized according to levels of attention and meditation of the headset wearer, leading the listener to unexpected musical realms which somewhat correspond to his or her neuro-electric activity. One may try to attain control over the musical line and advance within it through deliberate control over levels of relaxation and concentration. The EEG headset that was used for the project is NueroSky MindWave mobile. 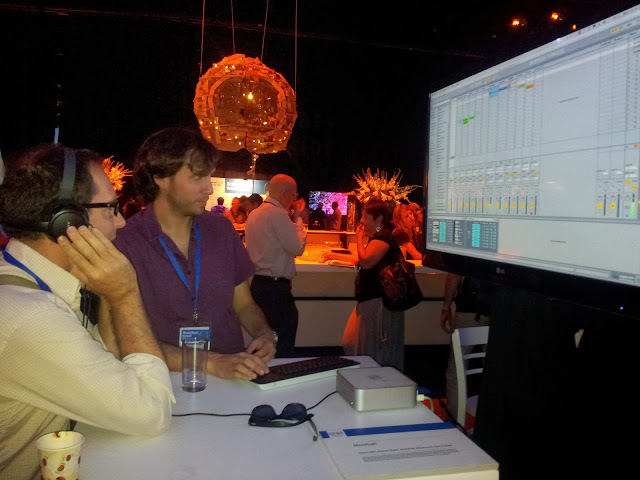 Music was composed in Ableton Live using Max for Live to read the data from the headset. Many thanks to Zvika Markfeld and Saron Paz from ForReal Team, the exhibition curators.